The hunt continues for a deadly rogue alien accused of killing a human. ESA agents Rice and McIntyre abide by different rules which make this pursuit a tense, precarious affair. A city on shut-down, a cop with a hair-trigger, and a showdown that could alter intergalactic diplomacy forever. 'Port of Earth' continues to evolve from a savvy sci-fi premise to a thrilling cop drama to a thought-provoking commentary on American worker displacement and the otherness of aliens as an allegory for immigrants. It's not heavy-handed mind you but there are layers to Zack Kaplan's story. When you consider the seismic change an alien technology that helps turn water into an efficient and powerful energy source would have on the planet it's inevitable that it would set off a societal chain reaction. Especially for those displaced by this new technology. The series opens with a televised political discussion as the other issues have and it really helps to fill in the blanks of this new world. It's clever world building no doubt but the conversation between an ESA director and the host is quite riveting. In theory, this new energy tech would be a godsend for the environment and consumers eschewing harmful fossil fuels but it comes at a cost of jobs and new businesses. Especially when you consider the energy companies involved in the alien joint venture in the first place that holds a monopoly. Its consequences have been less than fruitful for the working class as perfectly illustrated by Andrea Mutti. The news montage tells a story of worker displacement and social anxiety that helps ground this world with relatable themes. On the ground, preparing to scour a city on lockdown, chasing down the rogue alien, Rice and McIntyre continue to spar over how to handle the situation. Having this familiar good cop-bad cop trope has been a vehicle for Mac to be the xenophobic partner who'll bypass protocol to find and shoot the alien. His opinions could be extrapolated to mirror the attitudes of some people in the real world about immigrants. Mac's the headstrong type that usually finds a way to get himself killed in other stories we've read and seen on screen. He'll get what's coming to him for being a jerk and not following the rules. However, little is known about exactly what led up to the alien killing a human. There's nothing definitive about what transpired between them so there's some mystery and an assumption of innocence that Rice believes but not Mac. Mutti does a wonderful job pacing the action and including plenty of detail in the character designs. Even in the first half of the book, despite the little action, Mutti moves things along with different perspectives and expressive reactions from the characters simply talking. The second half has more action and more staging as the agents navigate one corridor after another. Vladimir Popov's colors continue to be faint and very subtle. I'm not sure why there isn't more color as the book can seem almost black and white at times. What little Popov contributes is good but wish there was more of it. 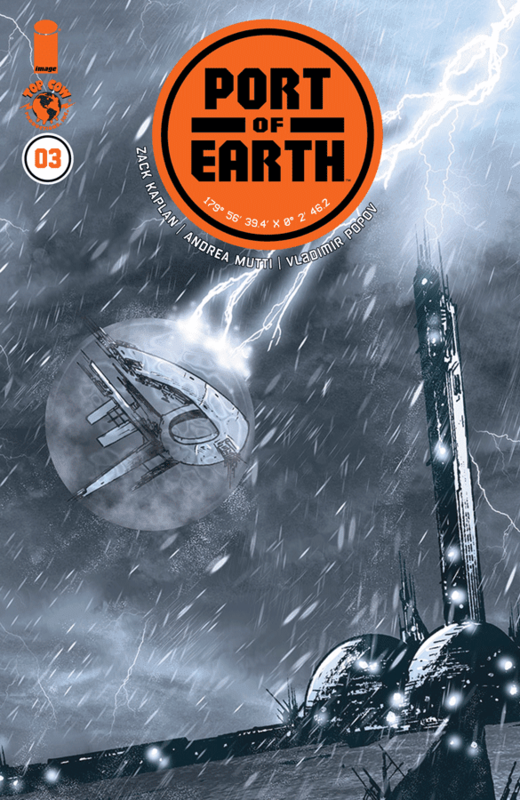 'Port of Earth' is an intense thought-provoking sci-fi thriller. It's really a smart meditation on more than just a spaceport on earth. With such an agreement comes costs that aren't foreseen but Kaplan does a great job challenging our own attitudes about a shared galactic community. It's a subversive allegory to our world with the added bonus of a police procedural. Things end on a cliffhanger that sets up a confrontation we've been waiting for.